There are no known case reports of hepatic steatosis caused by oral fluoropyrimidines such as capecitabine. With increasing use of capecitabine since its approval for the treatment of metastatic colon cancer in 2001, and more recently for adjuvant treatment of colon cancer and treatment of metastatic breast cancer, we can anticipate increased recognition of potential toxicities associated with this 5-fluorouracil derivative. We report the case of a 74-year-old Armenian woman who received capecitabine as adjuvant treatment for colon cancer and subsequently developed abnormal liver biochemical tests and radiographic findings in keeping with hepatic steatosis. There was complete reversal of liver enzyme abnormalities with discontinuation of the drug and this patient represents a case of reversible liver injury due to capecitabine. In this original case report, capecitabine use was associated with hepatic steatosis. It is important for clinicians to recognize and monitor for this potential toxicity, which may be a cause of abnormal liver enzymes in this patient population. Capecitabine is an orally administered precursor of 5-fluorouracil (5-FU), a fluoropyrimidine antimetabolite. It is converted to 5-FU preferentially in tumor tissue, and also in the liver, by way of a three-step enzymatic cascade . Capecitabine is a relatively new agent, with FDA approval in 2001 for use as an alternative to the Mayo Clinic 5-FU/folinic acid regimen for metastatic colon cancer. It has since been approved for use in the adjuvant treatment of colon cancer, as well as for metastatic breast cancer. Hepatic steatosis, a mild manifestation of non-alcoholic fatty liver disease (NAFLD), may occur after treatment with 5-FU. This has become a more recognized complication in the era of hepatic surgery for colorectal liver metastases, where hepatic steatosis is associated with increased post-operative morbidity . Peppercorn et al. found that 47% of patients with colorectal liver metastases treated with systemic 5-FU and folinic acid had computed tomography (CT) findings consistent with fatty change. Another report described laboratory abnormalities consistent with hepatic toxicity in 40% of patients who received adjuvant therapy with 5-FU and levamisole after undergoing surgical resection for Stage II or III colon cancer, with CT and biopsy evidence of steatosis in a few cases . There are, however, no known reports of liver damage caused by oral fluoropyrimidines . A 74-year-old Armenian woman with Stage III colon cancer was treated in the adjuvant setting with capecitabine. Comorbid conditions included type II diabetes mellitus, hypertension and gastroesophageal reflux disease; her concomitant medications included glyburide, metformin, telmisartan, atenolol and lansoprazole. She had no known hepatic disease, no history suggestive of Hepatitis B or C exposure and did not drink alcohol. Baseline liver enzymes and bilirubin were normal (AST 11 U/L [normal < 35 U/L], ALT 7 U/L [normal < 40 U/L], bilirubin 7 μmol/L [normal < 22 μmol/L]) and pre-treatment staging investigations including magnetic resonance imaging (MRI) of liver (performed due to CT contrast allergy) demonstrated no evidence of metastatic disease. Adjuvant chemotherapy was initiated with capecitabine at 1000 mg/m2 twice daily for 14 days every three weeks, for a planned total of eight cycles. She developed Grade 2 diarrhea with the first cycle, with dose reduction to 750 mg/m2 twice daily, which was well tolerated. Her transaminases started to rise after the third cycle of capecitabine (AST 44 U/L, ALT 57 U/L, bilirubin 18 μmol/L), with further elevation as well as mildly increased bilirubin after the fourth cycle (AST 73 U/L, ALT 101 U/L, bilirubin 24 μmol/L). She remained anicteric and had no symptoms of hepatic dysfunction. Capecitabine was delayed while imaging investigations were arranged to rule out the possibility of hepatic dysfunction due to liver metastases. Other causes of liver disease such as viral hepatitis were considered and ruled out with negative serology for Hepatitis B and C.
MRI of her abdomen demonstrated marked hepatomegaly with severe fatty infiltration of the liver; the significant signal drop in out-of-phase compared to in-phase imaging, which was not present on baseline scans, confirmed severe hepatic steatosis (see Figure 1A-D). There was no evidence of metastatic disease. Capecitabine-induced hepatic steatosis in a 74-year-old woman. Dual-echo, chemical shift gradient-echo T1-weighted magnetic resonance images show no evidence of hepatic steatosis which is demonstrated by the signal intensity of the liver on the in-phase (TR/TE, 150/4.5) image (A) similar to that of the out-of-phase (150/2.3) image (B). 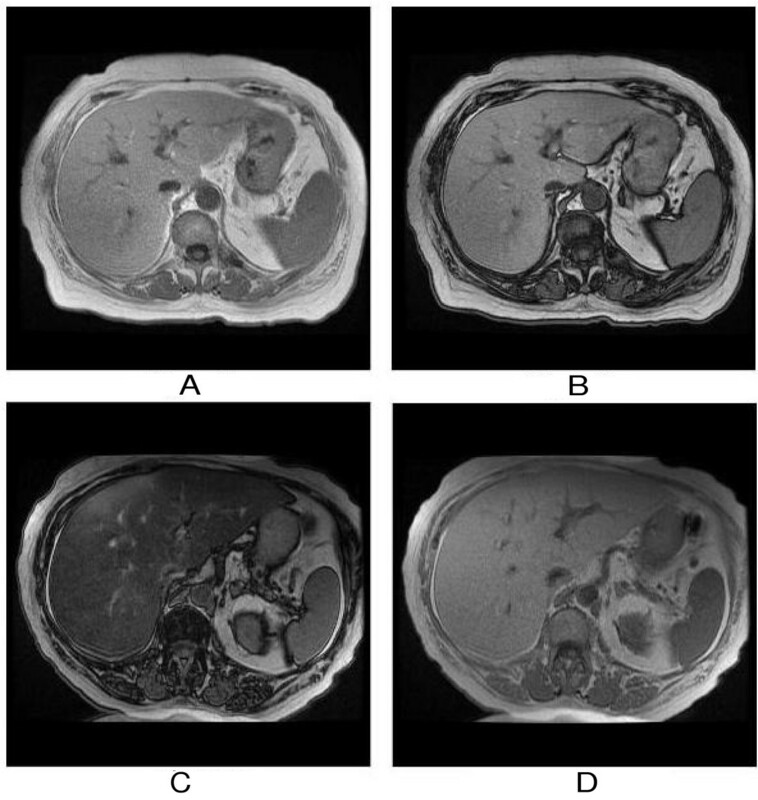 Three-month follow-up magnetic resonance images after treatment with capecitabine clearly show newly developed severe hepatic steatosis which is seen as a drop of the signal intensity of the liver on the out-of-phase (150/2.3) image (C) compared with the in-phase (150/4.5) image (D). A clinical diagnosis of capecitabine-induced hepatic steatosis was made. Capecitabine was held and after one month, there was a decline in the transaminases and bilirubin to normal (AST 27 U/L, ALT 35 U/L, bilirubin 13 μmol/L). After consultation with the hepatology service, it was decided that the risk of disease recurrence likely outweighed the risk of irreversible liver injury due to capecitabine. After discussion with the patient and her family, it was decided to cautiously rechallenge her, with close monitoring of the liver enzymes. Transaminases and bilirubin remain normal after the first rechallenge cycle (AST 30 U/L, ALT 41 U/L, bilirubin 9 μmol/L). The spectrum of liver changes associated with fat accumulation in hepatocytes is termed non-alcoholic fatty liver disease (NAFLD) . Although abnormal liver function tests and radiographic findings may be suggestive of NAFLD, histological evaluation remains the only way to assess hepatocyte damage and to distinguish 'simple' steatosis from steatosis with inflammation, or the more serious steatohepatitis, which can progress to cirrhosis . The classic findings of fatty liver associated with abnormal liver tests and the improvement in transaminases upon drug interruption render NAFLD due to capecitabine the most likely diagnosis in our patient. A liver biopsy for histological confirmation was not pursued in our patient, who fortunately had complete reversal of liver enzyme abnormalities with discontinuation of the drug, and therefore likely had a reversible mild form of steatosis. In this original case report, the patient presented represents a case of hepatic steatosis associated with the use of capecitabine. It is important for clinicians to recognize and monitor for this potential toxicity, which may be a cause of hepatic dysfunction in this patient population. This is especially important as these patients are also at risk for hepatic metastases, which may present similarly and need to be considered in the differential diagnosis. With increased capecitabine use, we anticipate more cases of NAFLD associated with this 5-FU derivative. LS made the initial clinical diagnosis, with the assistance of TK who interpreted the radiological findings regarding hepatic steatosis. SC performed the literature review and was responsible for writing the manuscript. All authors read and approved the final manuscript.